← New Starter Motor – New Beginning? I'm shuddering as I type this....but I actually listed my 100 Land Rover for sale on eBay. Yes, Murpha and I very nearly parted company. I can't remember exactly when, but looking at the date of my old saved documents, it may have been around January 2012. I was going through a bit of a bad spell at the time; money was tight, my head wasn't in the right place and, to be honest, I was hardly ever driving my Landy. So, in a mad moment one weekend, I took a few photos and listed her. An observer would have been able to tell that I wasn't that keen to sell her; questions were coming in thick and fast on eBay, but I didn't bother answering most. Even though I'd gone to all the trouble of listing Murpha for sale, I wanted to take no part in actively selling her. Daft as that may seem, especially as it meant that I'd get fewer bids, I wanted to wash my hands of the whole process. I purchased this Land Rover in May of last year and it has never let me down. It starts first time, gets to a good temperature reasonably quickly and plods along all day. The only reason I am selling it is that I have to cut down on my toys. It's not so much the cost, but the fact that I rarely get to drive any of them! I have a hot rod and a convertible, and I want to play with those in 2012, so this toy has to go. This Land Rover went straight through the M.O.T. last year with no advisories (I had a swivel pin fitted first), and it has also had four new tyres fitted at a cost of £550. Being the 2.5 normally-aspirated (i.e. non-turbo) diesel engine, it's not particularly quick. That said, I used it to travel from Ipswich to Norwich on a daily basis for a few weeks over the summer and it's perfectly suitable for road use. The speedo shows it has done 201,000 miles, but I have no idea if it is the original engine. If it is, that's incredible, as it motors with no problem whatsoever. There is a slight puff of smoke when it starts, but this doesn't remain for long at all and it uses very little oil. From what I'd been told about Land Rovers before I got this one, I thought it would be a lot more 'thirsty' in that department. Of course, most people don't buy a REAL Land Rover for road use, though, and this is where this vehicle comes into its element. These are great off-road vehicles and this example has good ground clearance, chunky tyres (but good for road use) and plenty of torque. Like most Land Rovers, it has been chopped and changed over the years. I believe that it started life as an Estate, but is now a van. I am not a mechanic, so invite anyone to come to Grundisburgh to take a look before bidding. Everything on it seems solid, though, and I had a Land Rover enthusiast look over it before I bought it and he was suitably impressed. A shooting hatch has been fitted in the main roof, the interior has been panelled and there is a mains plug into the vehicle, suggesting it may have been used as a camper. I HAVE NOT TESTED THESE ELECTRICS. There is also a kind of 'false-floor' inside, allowing tons of storage space for tools, camping equipment, etc. I put some Jate rings on the front last year, with the intention of going off-roading, but never got around to it. All Land Rovers look sweet from a distance, but many don't look quite so nice close up. This has a rough-and-ready hand-paint job and a few signs that it is over 25-years old. That said, it is not in bad nick at all for its age and everyone seems to love it. The interior could do with a clean up. A couple of hours with a hoover and a paint brush to the inside of the roof wouldn't go amiss. As you'll see from the photos, it is a bit shabby around the shooting hatch. It's only wood, though, so a quick lick of paint will sort it. Land Rovers shake, rattle and roll their way through life. They all leak a bit when it pees down, too. It's part of their character. This is no exception. That said, you soon learn to love them and I get waved at, spoken to in car parks and all sorts of friendly banter when I go out in this 'car'. Land Rover owners are a friendly bunch. Even if you don't buy this one, I'd advise owning at least one Land Rover in your life so that you can experience that for yourself! I'll be sad to let this vehicle go, but I really do need to free up some time for my other toys. There is a brand-new CB fitted and everything you see is included, except the contents. As you may have noticed by the interior pics, it gets used to store a lot of my stuff! If you have any questions, please ask. I am not a Land Rover mechanic, however, so please don't expect to get technical answers. YOU ARE WELCOME TO COME AND VIEW THIS VEHICLE. I am located in Grundisburgh, Suffolk, and am fairly flexible with times, as I'm self-employed. I have mentioned to a few people that this car is for sale and have had a few enquiries already, so reserve the right to withdraw the auction early. That said, if a few people are interested on here and get their bids in, then I won't feel the urge to! Payment is cash on collection within 3-days, please, with £200 payable by Paypal as a deposit when the auction closes. No warranty is implied or offered – as with most private car sales on eBay, this car is sold as seen. NOT for sale - okay?!! THANKFULLY, my indifference paid dividends. She didn't reach reserve. Inside, I was immensely relieved. The God of Landy's had told me not to be a pillock. Well, not today, anyway. Of course, this being eBay and half the members thinking they are the next Richard Branson, I had a few wheeler-dealers contacting me to offer me even lower prices for my Land Rover, as I “must be desperate to sell it” now. That happens a lot on eBay, not just with cars, and it always makes me chuckle. Anyway, I took this as my sign to keep Murpha. I knuckled down, got my bills paid and hung on to her by the skin of my teeth. Now, when I look back and think how much I love that old truck and how much fun I've had (and will have) because of her, you can understand why I said I'm shuddering when writing about nearly selling her. 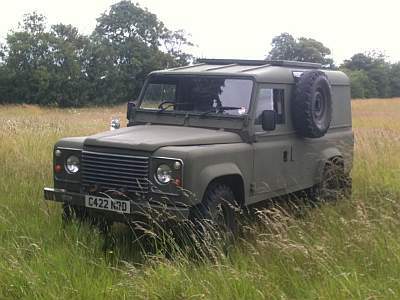 So, for the record, THIS 110 LAND ROVER IS 100 NOT FOR SALE! No items matching the keyword phrase "110" were found. This could be due to the keyword phrase used, or could mean your server is unable to communicate with Ebays RSS2 Server.